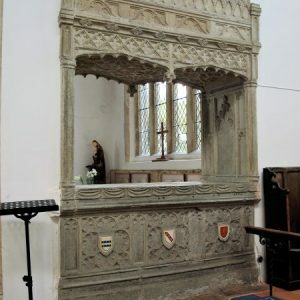 Holy Trinity Church at Blythburgh was built by the monks from Blythburgh Priory following grant of permission for this from Henry IV in 1412. Nothing remains of earlier buildings on the site, although one is mentioned in the Domesday Survey of 1086, and it is believed that a Saxon church existed here maybe as far back as AD630, when Christianity was struggling to survive against the old pagan religions. The west tower pre-dates the main body of the church, being early to mid 14th century. 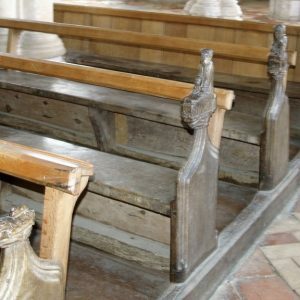 The church has retained almost all of its 15th century architecture, the emphasis on vertical lines being typical of the Perpendicular Gothic style of the time. 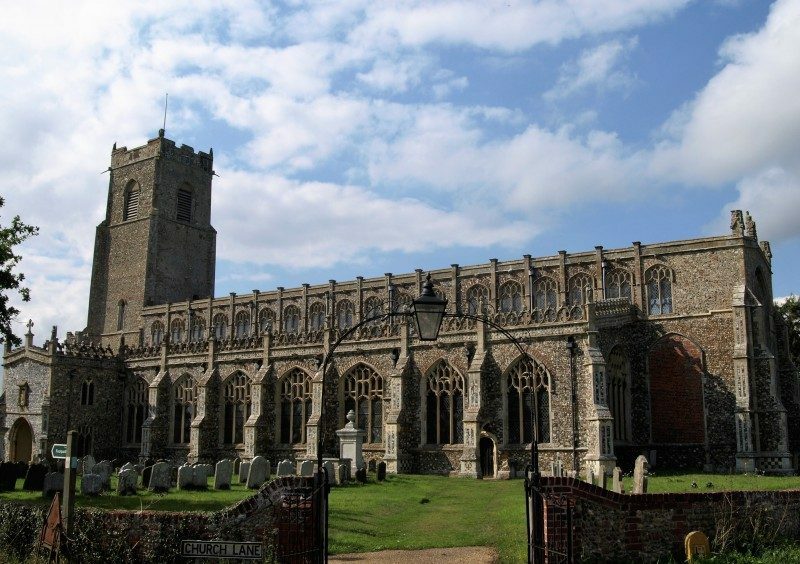 This and the size of the building (a result of the patronage of the important medieval Blythburgh Priory) make Holy Trinity an impressive sight on approach from the surrounding salt marsh countryside. 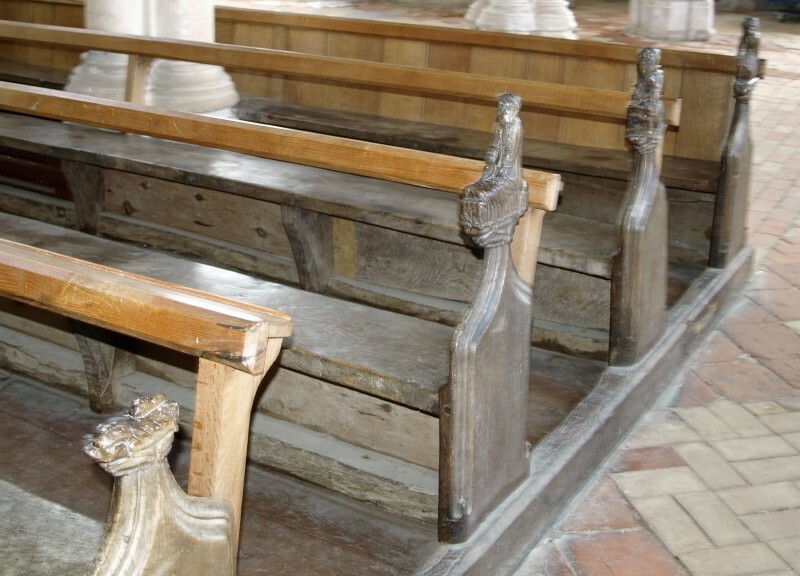 This is supplemented by the interior which boasts an ‘angel roof’, (found in over 100 East Anglian churches), 15th century carved pew ends, alms box dated 1473, beautifully carved choir stalls, 15th century lectern, 2 tomb chests, fragments of medieval glass in the windows, and a font dating from c1450 originally carved with the Seven Sacraments. 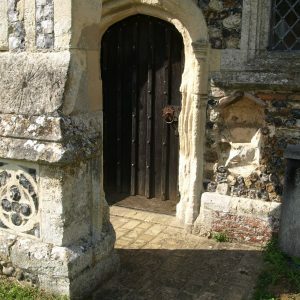 The first photograph in the gallery below is of the south porch, built at the western end of the south aisle. 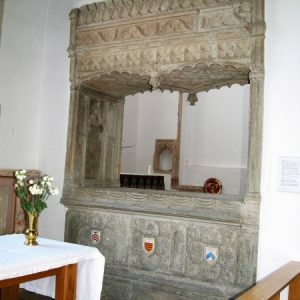 There is a holy water stoup on the right of the entrance. 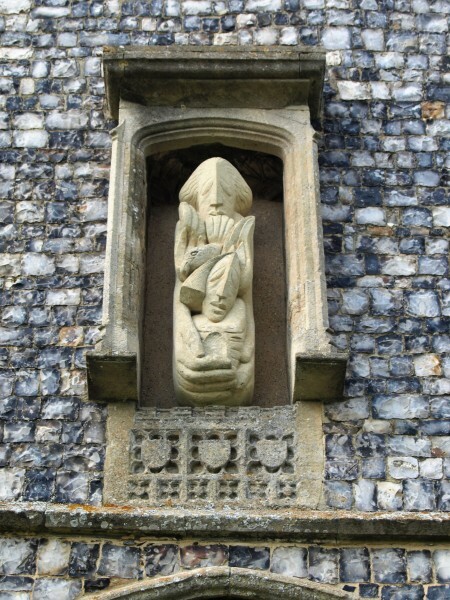 The second photograph shows a niche above the porch doorway that houses a modern image (after 1966) depicting the Holy Trinity, with God the Father above a dove representing the Holy Spirit, and God the Son. 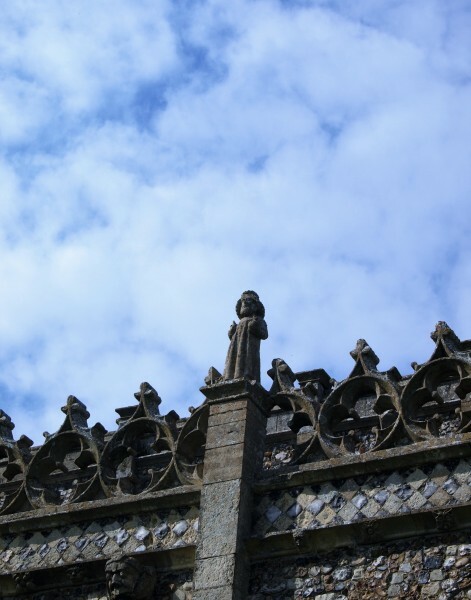 The third photograph is of one of the carved figures which sit on pedestals atop the south aisle buttresses. The one shown is of ‘Christ the Saviour’. The other six are: the Virgin Mary; a seated woodwose (wild man); two bears, one with a chain and heavy weight, the other with a staff; a fox with a goose in its mouth; and a griffin. 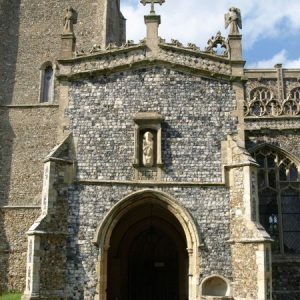 Other carved figures include ‘God the Father’ on the east gable, and angels on the porch. 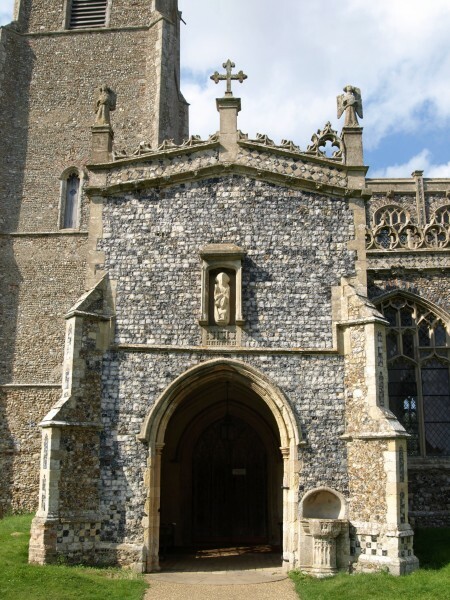 Next shown is the priest’s doorway under the flying buttress towards the eastern end of the south aisle. 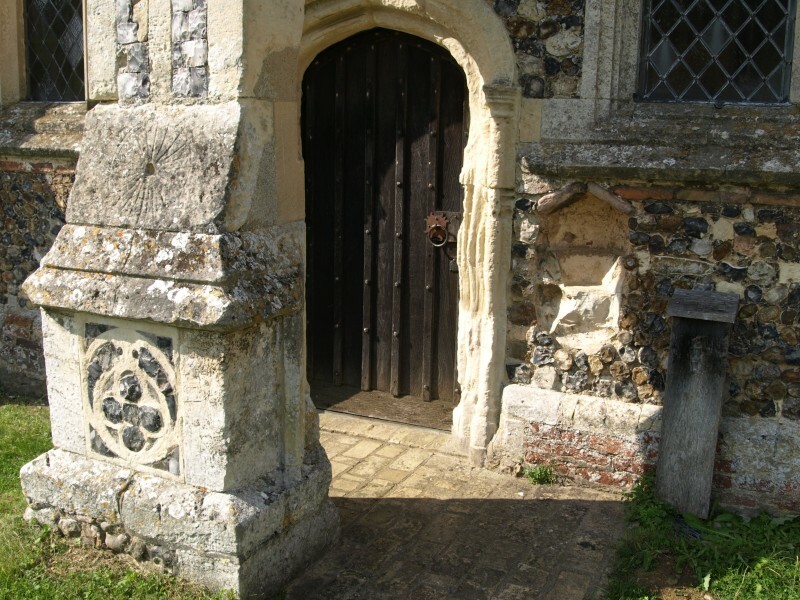 There is a similar buttress and priest’s doorway, immediately opposite on the north aisle. 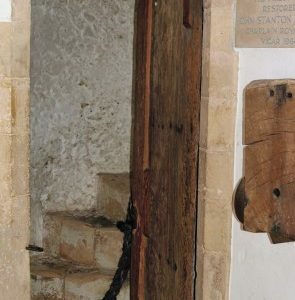 To the right of the door is a much mutilated holy water stoup. 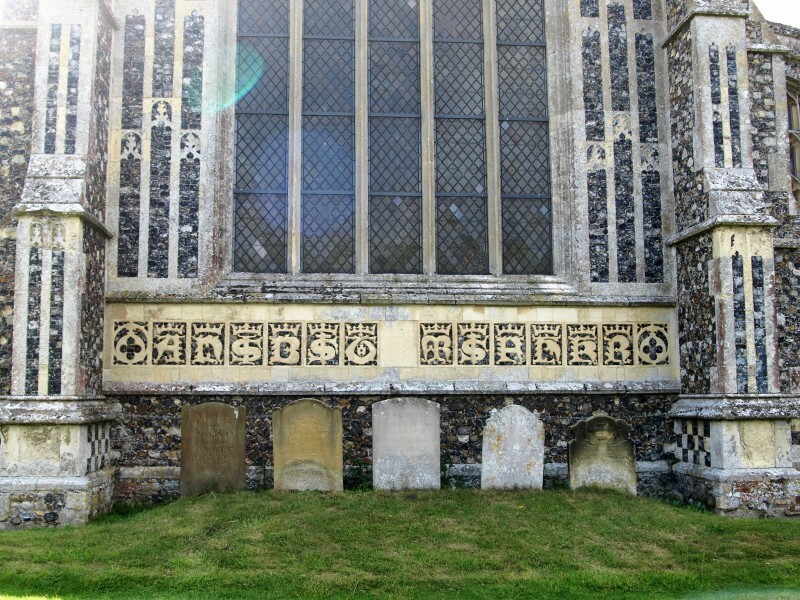 The fifth photograph shows Lombardic lettering along a frieze under the Perpendicular east window. The letters are: A N JS B S T M S A H K R. They probably represent ‘Ad Nomina Jesus, Beati Sanctae Trinitas, Maria Sanctorem, Anne Sanctorem, Katherine, Reconstructus’, which translates to ‘In the name of Jesus, the Holy Trinity, the Holy Mary, Holy Anne and Katherine, this was rebuilt’. 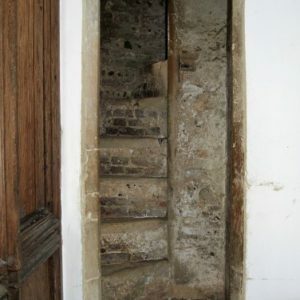 The next photograph is of the stairs which lead from the corner of the south aisle, just inside of the porch, to the priest’s room which is above the porch. 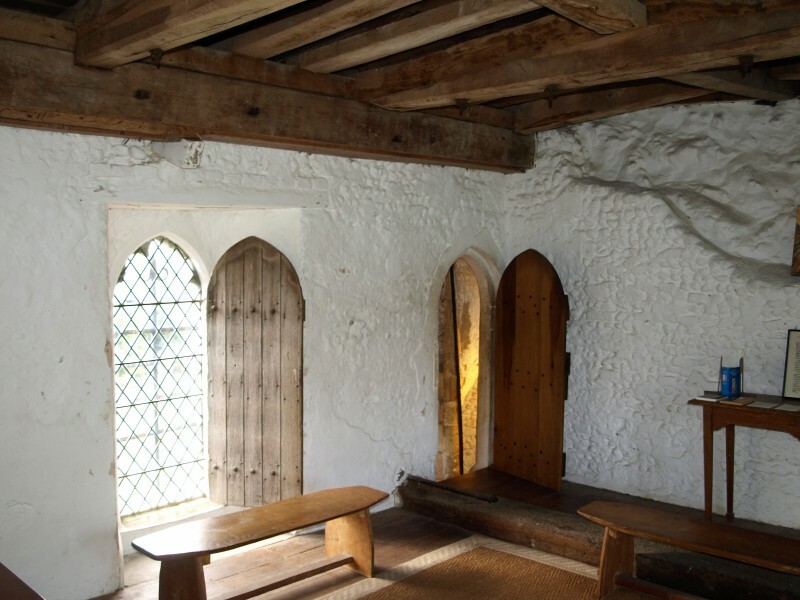 The priest’s room was restored in the 20th century, and is shown in the final photograph in this gallery. 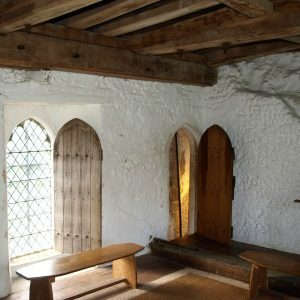 A room above a porch is also sometimes called a parvis(e), although this more correctly refers to an open space or colonnade in front of a church. As well as a room for private prayer for the priest, these rooms were variously used as stores, school rooms and even on occasion, prisons. 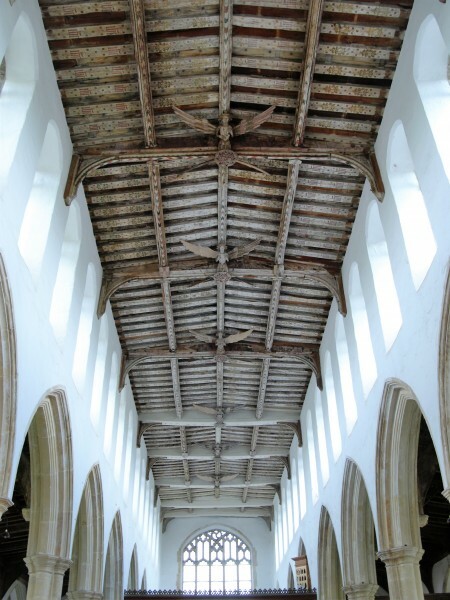 The second gallery starts with a photograph of the roof which extends from the east wall of the tower along the nave and over the chancel to the east gable. 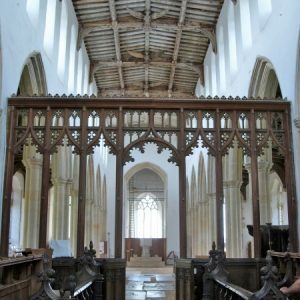 There are 10 arch-braced bays with tie beams that have a carved central boss and pairs of decorative angels, facing east and west. 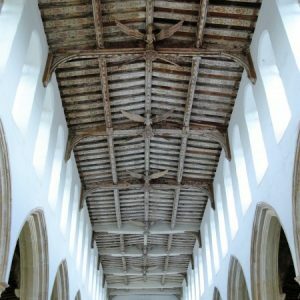 ‘Angel roofs’, as they are known, are a feature of East Anglian churches, and Holy Trinity, Blythburgh is a fine example. Eleven angels of a probable total of twenty ( 1 pair for each tie beam) have survived. 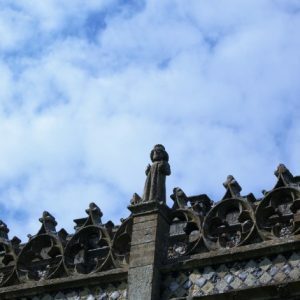 The others, at the west end of the church, were lost when the roof was damaged by the falling steeple in a severe storm in 1577. 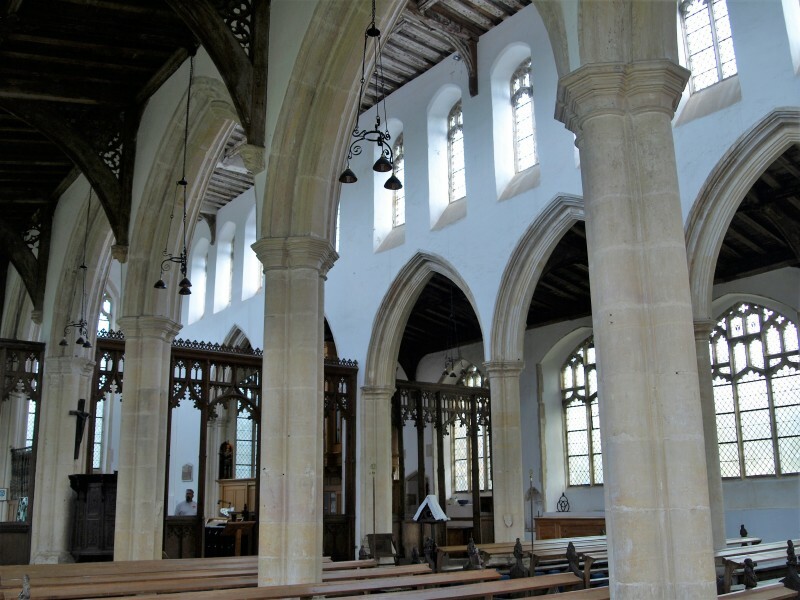 The next photograph shows the 15th century north and south aisle arcades, and the clerestory windows, which were restored in Perpendicular style in the 19th century. 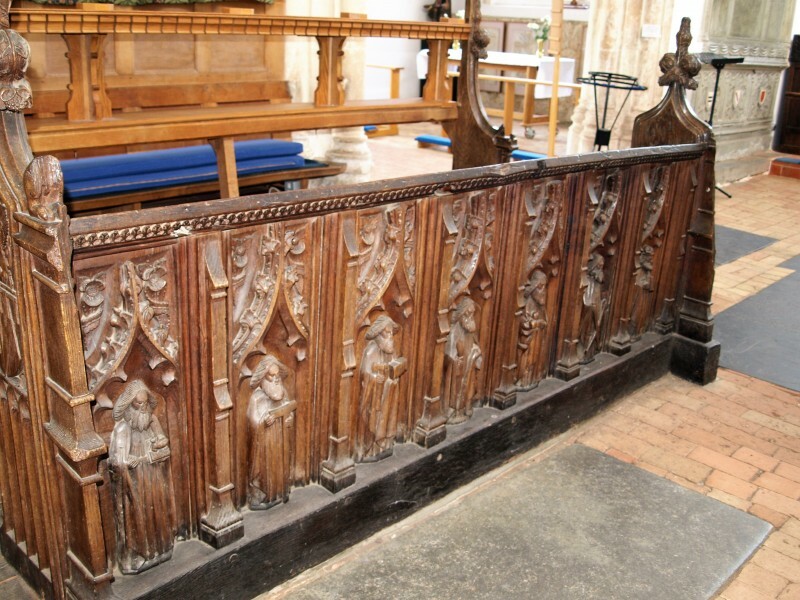 The third photograph in this gallery shows the 15th century nave benches with superb carved ends representing the Seven Deadly Sins, the Seven Acts of Mercy, the four seasons, and various angels. 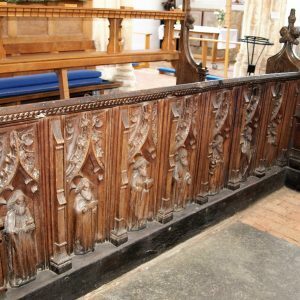 Next shown are some of the choir stall carvings, which are probably not 15th century, but are, nonetheless, very fine carvings. They include: Christ in Majesty, The Virgin Mary, the Apostles, and the Evangelists. 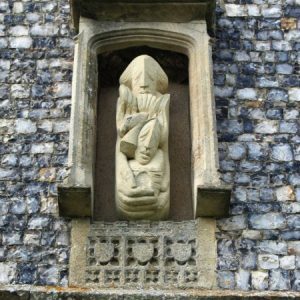 St Etheldreda, who died in the nearby Battle of Bulcamp in AD654, is also depicted. 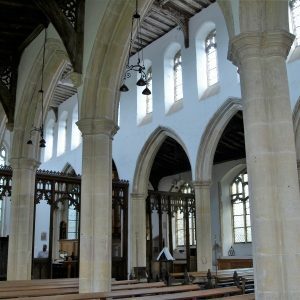 The fifth photograph is a view westwards from chancel to nave. 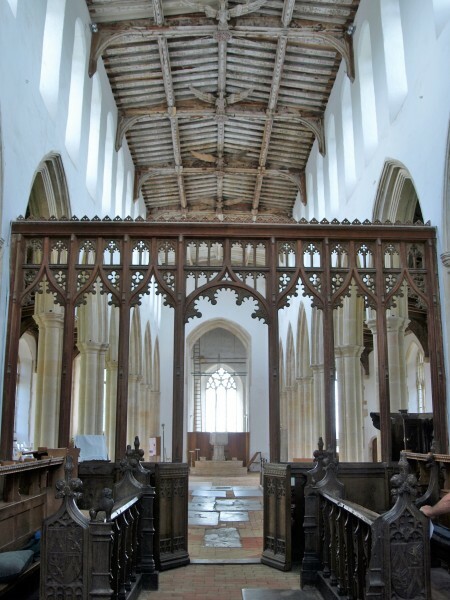 The screen, which is largely modern, extends across both aisles as well as the nave. 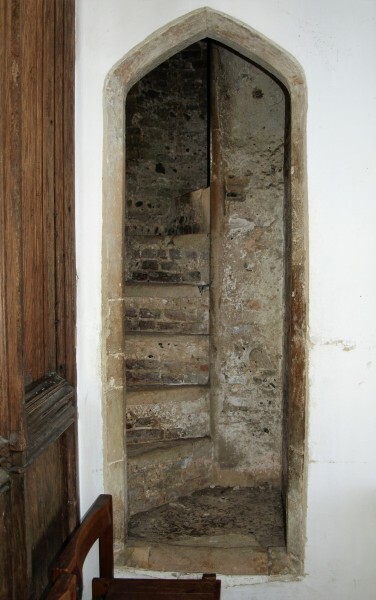 Next shown is the doorway to the rood stairs, used pre-Reformation to access the former rood loft. 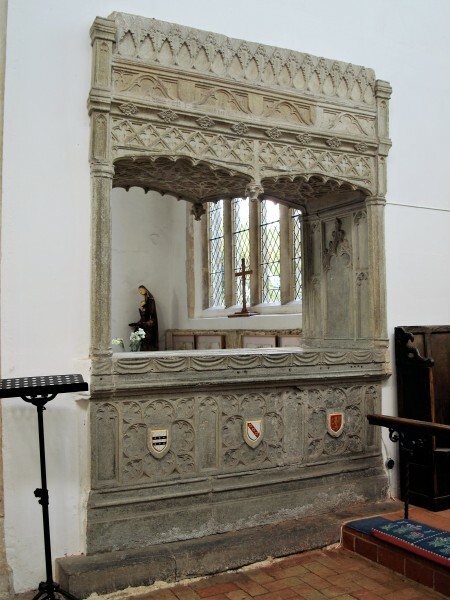 Both sides of the Sir John Hopton (d.1489) tomb are shown next. 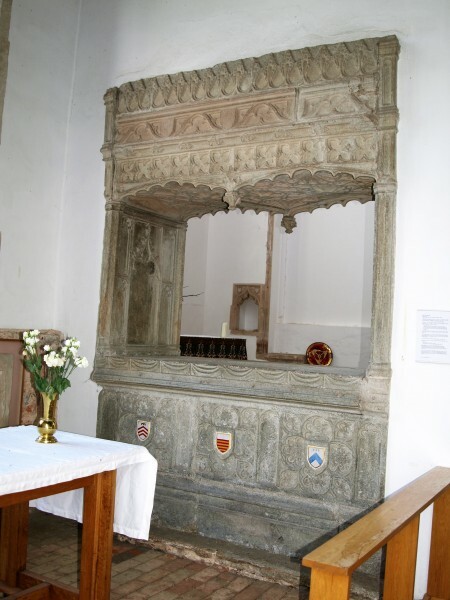 The Purbeck marble tomb chest stands between the chancel and the eastern end of the north aisle (Hopton/chantry chapel) under a fine carved canopy. 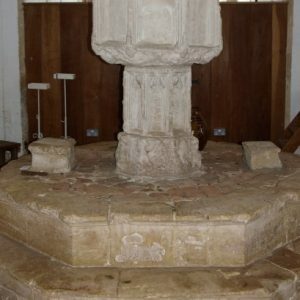 The last photograph is of the 15th century octagonal font. 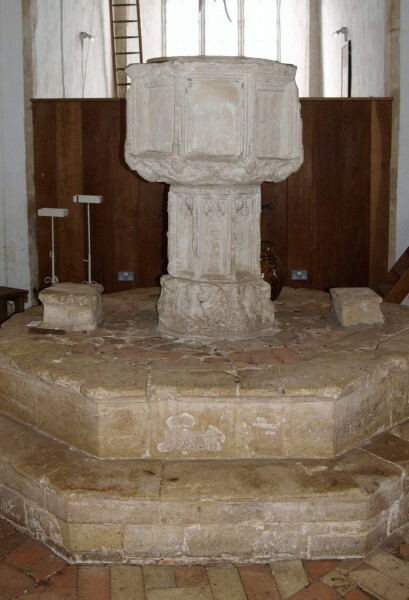 It was originally carved with representations of the Seven Sacraments of the catholic church (Baptism, Confirmation, Eucharist, Penance, Anointing the Sick, Holy Orders, Matrimony), but was damaged when the church spire was struck by lightning in a severe storm in 1577 causing it to fall through the roof and hit the font. 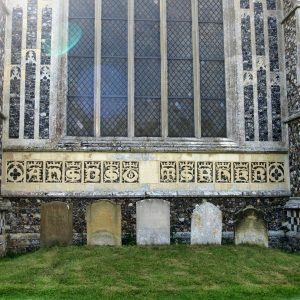 The following century it may well have been further defaced following the visit of William Dowsing during his puritan purge of East Anglian churches in 1644.